Under the CLAR funding announcement yesterday, the above Playground which is insured and maintained by Donegal County Council, received a funding allocation of €8,350 to allow for the replacement of rubber matting. 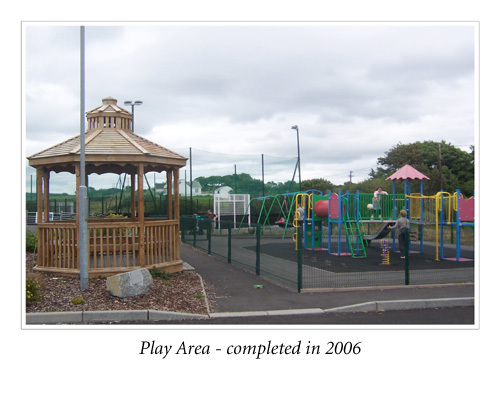 The Playground was constructed in 2006, by the Dolmen Centre Committee, and has been a very successful asset to the site. Through their endeavours, the issue of insuring the area was taken on by the Council. The Committee carry out regular inspections of the Playground, and any faults are relayed to the Council for resolution. The Committee are indebted to Donegal County Council for the service they provide, both in terms of maintenance and insurance. Also, thanks to Cllr. Terence Slowey who made representations on our behalf to have this work carried out.